These are indeed the most 'Breathtaking Viewing Platforms' around the World. For those like me, who has a tremendous phobia of height, there is no way I would ever set foot, on any of them. Definitely, not for the light-hearted. 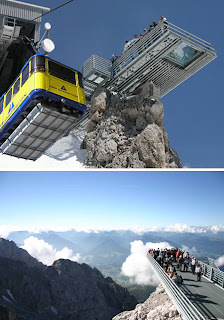 Nicknamed the "balcony of the alps," the Dachstein Sky Walk is formally enthroned at 2700m above sea-level, high up on the 250m vertical rock face of the Hunerkogel. A 360o panorama allows the visitor a view of Slovenia in the south to the Czech Republic in the north. 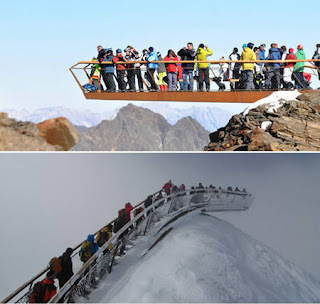 The Sky Walk is distinctly higher than the platforms of the Niagara Falls or even the one at the Iguazu waterfalls in Brazil . Architects Todd Saunders and Tommie Wilhelmsen were commissioned to design a scenic rest-stop 2000ft above Aurland fjord in Norway and came up with this beauty wining the first prize in Norwegian tourist routes competition. The outermost end of the horizontal platform - which curves to form the structure's support - is closed off by a sheet of glass, offering an incredible view towards the ground for all those with the guts to make the trip to the end. This horseshoe-shaped pant-filler hangs approximately 4000ft above the floor and extends 65ft beyond the edge of the Grand Canyon . 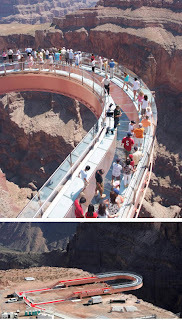 The Horseshoe shaped skywalk is constructed of glass walls 4" thick and visitors just don special scratch-proof socks as they partake in the view. The work is a true engineering feat that can hold up to 70 tons (roughly 14 African Elephants) and withstands winds of 100mph. While the falls themselves are magnificent, their setting in a huge subtropical nature reserve makes visiting even more enjoyable. To fully appreciate their size and splendor it's worthwhile viewing the falls from the skywalk. 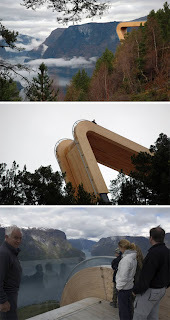 The viewing platform is so close you are instantly drenched by spray and deafened by the roar of water plunging over an 80m cliff. 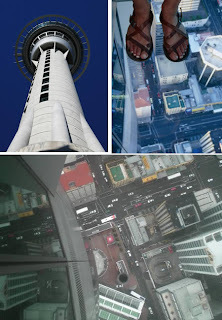 Auckland's 328m Sky Tower. It took 2000 tons of reinforcing steel, 660tons of structural steel and 15,000m3 of concrete to erect it. It can withstand 200km/h winds, earthquakes up to eight on the Richter scale and on a clear day, visibility is around 82km. The highest indoor point is Sky Deck, which has seamless glass giving unimpeded 360º views. This walk opened recently after five months of construction. 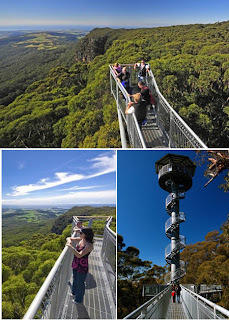 Located at Knights Hill up high on the escarpment near Robertson in the Southern Highlands , the Illawarra Fly Tree Top Walk allows visitors to walk among the rainforest canopy 25m above the ground on a steel platform. The 500m elevated walkway features cantilever arms that take visitors to the edge of the escarpment and offer inspiring views of the coastline from Kiama through to Shellharbour. 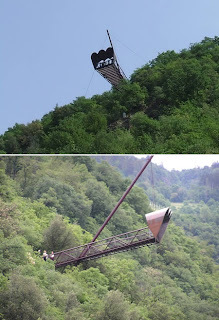 The landscape promontory is a suspended viewing platform designed by Paolo Bürgi as part of the Cardada project, a revitalization of the Cardada mountain that is expected to finish in 2010. 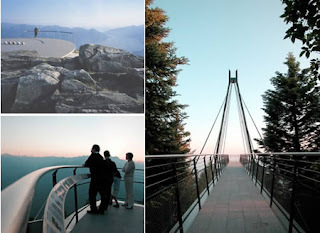 The passageway is made of steel and titanium leads to the lookout platform with a view of Lago Maggiore. The landscape panorama is not the only thing that visitors are meant to appreciate. Symbols in the paving with accompanying texts in the railing provide references to history and literature. The House on the Rock, originally opened in 1959, is a complex of architecturally unique rooms, streets, gardens and shops designed by Alex Jordan, Jr. It is located in Spring Green, Wisconsin and is a regional tourist attraction. The Infinity Room at the House extends several hundred feet over the valley, without supports underneath, and is lined with over 3000 handmade windows. Top of Tyrol by Aste architecture is a viewing platform located 3000m above sea level at the Stubai Glacier in Tyrol , Austria . Weathering steel was used in the construction of this structure to account for the extreme weather conditions so you can stand 9m away from the mountain with a perfect view of Stubai glacier. 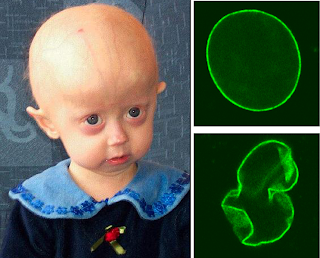 What is Progeria (Premature Aging) ? After watching a short video presentation by Jeremy Kyle (a famous British Talk Show), I was indeed sadly moved after knowing the real situation, faced by 02 special patients, who are suffering from this extraordinary rare sickness. It was known that there are only 02 such patients (unfortunately, they were both girls) in the United Kingdom and only around 45 of them, in the whole entire world. Jeremy was kind enough to bring the 02 patients together for the 01st time and I can imagine how the 02 parents felt when they had such rare opportunity to meet with each other and undoubtedly, I can also see the teary eyes of all the audience too. In this extreme rare, severe and genetic condition, it is said that all the internal organs of such a person, will age 08 years in advance within a year. When the 02 girls appeared in this show, they were just 05 years old, BUT their bodies are already 40 years old. So far, record shows that such victims will only live up to around 13 years of their own age. Their death is often due to Heart Attack, or Stroke. It is hoped that a 'cure' can be made possible one day, by the Medical Field. How is Lauric Acid Used by our body ? 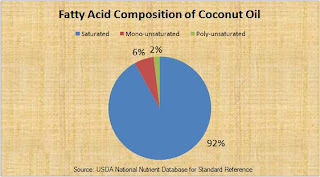 Coconut oil consists of more than ninety percent of saturated fats (Don’t panic ! First read to the last word. Your opinion may change), with traces of few unsaturated fatty acids, such as monounsaturated fatty acids and polyunsaturated fatty acids. Virgin Coconut Oil is no different from this. Let us have a bit detailed study of this. Most of them are Medium Chain Triglycerides, which are supposed to assimilate well. Lauric Acid is the chief contributor, with more than forty percent of the share, followed by Capric Acid, Caprylic Acid, Myristic Acid and Palmitic. Gallic Acid, which is phenolic acid. These poly-phenols are supposed to be responsible for the fragrance and the taste of Coconut Oil and Virgin Coconut Oil is rich in these poly-phenols. * Certain derivatives of fatty acid like Betaines, Ethanolamide, Ethoxylates, Fatty Esters, Fatty Polysorbates, Monoglycerides and Polyol Esters. * Fatty Chlorides, Fatty Alcohol Sulphate and Fatty Alcohol Ether Sulphate, all of which are derivatives of Fatty Alcohols. * Vitamin-E and Vitamin K and minerals such as Iron. 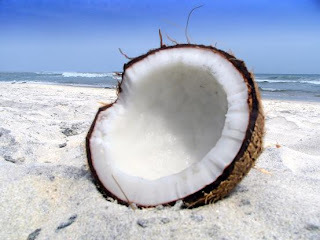 Coconut oil is one of the best natural nutrition for hair. It helps in healthy growth of hair providing them a shinny complexion. Regular massage of the head with coconut oil ensures that your scalp is free of dandruff, lice, and lice eggs, even if your scalp is dry. Coconut oil is extensively used in the Indian sub-continent for hair care. It is an excellent conditioner and helps in the re-growth of damaged hair. It also provides the essential proteins required for nourishing damaged hair. It is therefore used as hair care oil and used in manufacturing various conditioners, and dandruff relief creams. Coconut oil is normally applied topically for hair care. Coconut oil is excellent massage oil for the skin as well. It acts as an effective moisturizer on all types of skins including dry skin. The benefit of coconut oil on the skin is comparable to that of mineral oil. Further, unlike mineral oil, there is no chance of having any adverse side effects on the skin with the application of coconut oil. Coconut oil therefore is a safe solution for preventing dryness and flaking of skin. It also delays wrinkles, and sagging of skin which normally become prominent with age. Coconut oil also helps in treating various skin problems including psoriasis, dermatitis, eczema and other skin infections. Therefore coconut oil forms the basic ingredient of various body care products such as soaps, lotions, creams, etc., used for skin care. Coconut oil helps in preventing premature aging and degenerative diseases due to its antioxidant properties. Coconut oil is very effective against a variety of infections due to its antifungal, antiviral, and antibacterial properties. According to the Coconut Research Center, coconut oil kills viruses that cause influenza, measles, hepatitis, herpes, SARS, etc. It also kills bacteria that cause ulcers, throat infections, urinary tract infections, pneumonia, and gonorrhea, etc. Coconut oil is also effective on fungi and yeast that cause candidiasis, ringworm, athlete's foot, thrush, diaper rash, etc.